Antibodies to a cytosolic soluble liver antigen (SLA) are specifically detected in patients with autoimmune hepatitis (AIH). The target of anti-SLA has been identified as a ~50 kDa UGA serine tRNA-associated protein complex (tRNP(Ser)Sec), through the screening of cDNA libraries. A recent report questioned the identity of tRNP(Ser)Sec as the real SLA antigen. The latter study identified α-enolase as a major anti-SLA target, through proteomic analysis. In an attempt to explain the observed discrepancy we have investigated reactivity of SLA positive sera against α-enolase and tRNP(Ser)Sec using rat and primate liver homogenate and the recombinant antigens. Thirty-three serum samples, 11 from SLA-positive patients and 22 from SLA negative controls were investigated. SLA antibodies were detected by an inhibition ELISA and confirmed by immunoblot using human liver homogenate. Autoantibody reactivity was further evaluated using preparations of primate and rat liver homogenates. Anti-α-enolase antibody reactivity has been tested by immunoblot using recombinant α-enolase. An affinity purified goat polyclonal anti-α-enolase IgG antibody was used as reference serum sample. Anti-tRNP(Ser)Sec antibody reactivity was detected by ELISA or dot blot using recombinant tRNP(Ser)Sec antigen. The affinity purified IgG antibody directed to human α-enolase gave a band of approximately 48 kDa in both human and rat liver homogenates. A high titre anti-tRNP(Ser)Sec antibody serum gave a single band of ~50 kDa in both liver preparations. All but one anti-SLA antibody positive sera reacted with a ~50 kDa but none immunofixed a 48 kDa band. All anti-SLA antibody positive sera reacted strongly with the recombinant full length tRNP(Ser)Sec protein. None of the anti-SLA negative sera reacted with tRNP(Ser)Sec. Anti-SLA positive, and anti-SLA negative sera reacted equally against recombinant α-enolase by immunoblot. Pre-incubation of anti-SLA positive sera with tRNP(Ser)Sec completely abolished the 50 kDa band. The findings of the present study indicate that α-enolase and tRNP(Ser)Sec are both expressed in primate and rat liver and have a respective MW of 48 and 50 kDa. They also show that anti-tRNP(Ser)Sec – but not anti-α-enolase – correlates with anti-SLA antibody reactivity. Our findings indicate that tRNP(Ser)Sec is the most likely target of anti-SLA. Antibodies to a cytosolic soluble liver antigen (SLA), detected originally by an inhibition ELISA using cytosolic liver fractions in a sub-group of patients with autoimmune hepatitis (AIH) negative for other autoantibodies, have recently been also reported in adult patients with anti-nuclear and/or smooth muscle antibody (ANA/SMA) positive type 1 AIH and in seronegative patients with a form of cryptogenic hepatitis resembling type 1 AIH [1–6]. In pediatric patients, anti-SLA has been described not only in type 1 AIH but also in anti-liver kidney microsomal-1 antibody positive type 2 AIH and autoimmune sclerosing cholangitis [7–10]. Anti-SLA is specific for these autoimmune liver diseases, where it is associated with a more severe course and is virtually absent in non-hepatic autoimmune disorders [1–9]. The target of anti-SLA has been identified by several groups as a ~50 kDa UGA serine tRNA-associated protein complex (tRNP(Ser)Sec), through the screening of cDNA libraries [2–4, 7]. Anti-tRNP(Ser)Sec antibodies have been detected in up to 90% of serum samples positive for SLA by the original inhibition ELISA [1–8]. Using anti-SLA positive sera against rat liver cytosolic fraction in one and two-dimensional immunoblotting analyses and through peptide mass fingerprint analysis, following MALDI-TOF mass spectrometry, Ballot et al. identified four isoforms of α-enolase, – a cytosolic antigen of 48–50 kDa –, as the major target of anti-SLA positive sera. These findings challenge the notion that tRNP(Ser)Sec is the sole target of anti-SLA antibodies [2–8]. Critically, no absorption studies were performed with purified α-enolase to confirm this proposal . Moreover, α-enolase has been described as an antigen in several autoimmune disorders totally unrelated to autoimmune hepatitis [12–18]. 1. Are there any differences in α-enolase expression between rat – used by Ballot et al  – and primate liver homogenate – used by our study  – that could explain the discrepancy between these studies? 2. Is it true that failure of proteomic analysis to detect tRNP(Ser)Sec is due to its presence in trace amounts in the supernatant of liver homogenate ? 3. What is the reactivity of SLA positive and negative sera against recombinant α-enolase? 4. How do we explain the apparent paradox of SLA being identified as α-enolase by proteomic analysis and as tRNP(Ser)Sec by the screening of cDNA libraries? Do α-enolase and tRNP(Ser)Sec cross-react? In the present study, we have investigated reactivity of SLA positive sera against α-enolase and tRNP(Ser)Sec using rat and primate liver homogenate and the recombinant antigens. Thirty-three serum samples, 11 from SLA-positive patients and 22 from SLA negative controls were investigated. SLA-positive patients included 8 paediatric patients with AIH1 [7 female, median age 12, range 5–17 years, all ANA positive, median immunofluorescence (IFL) titre: 1/320, range 1/80–1/1280] and 3 adults with AIH/PBC overlap syndrome, (2 female, median age 56, range 47–65), all but one AMA positive (1/5120), and ANA positive (median tire 1/320, range 1/80–1/640). Eleven case-matched SLA negative patients were tested as pathological controls including 8 with AIH1 and 3 with AIH/PBC overlap syndrome. Eleven demographically matched healthy subjects including 8 children (7 female, median age 11, range 6–16) and 3 adults (2 female, median age 53, range 42–63) negative for SLA were also tested as controls. All sera have been tested for conventional antibodies by indirect IFL using rodent liver, kidney, stomach tissues. SLA antibodies were detected by a modified inhibition ELISA  and confirmed by immunoblot using human liver homogenate . Autoantibody reactivity was further evaluated using preparations of primate (Euroimmun, Lubeck, Germany) and rat (AID Autoimmun Diagnostika GmbH, Strassberg, Germany) liver homogenates, according to manufacturers' instructions. Anti-α-enolase antibody reactivity has been tested by immunoblot using recombinant α-enolase, as described previously . Briefly, the complete complementary DNA (cDNA) encoding human α-enolase was isolated from a cDNA expression library derived from synoviocytes obtained from a patient with rheumatoid arthritis (Stratagene, La Jolla, CA) and immunoscreened with goat anti-enolase antibodies. This cDNA was subcloned in frame in the pSPUTK in vitro translation vector (Stratagene) using the Apa I and Bam HI restriction sites. The translation product was synthesized as a separated biotinylated polypeptide, purified by SoftLink Soft Release Avidin Resin (Promega, Madison, WI), migrated in SDS-PAGE, according to the method of Laemmli, and electrotransferred onto a nitrocellulose membrane . The filters were then incubated with goat anti-enolase antibodies (see below), a monospecific anti-α-enolase antibody positive serum from a patient with rheumatoid arthritis or with individual serum samples, in Tris buffered saline, 0.05% Tween 20, 5% dry milk for 2 hours. After washing, the filters were incubated for 1 hour with 1:15,000-diluted peroxidase-conjugated goat anti-human IgG (Sigma-Aldrich) in 0.05% TBST-milk. The filters were washed and revealed by a chemiluminescence reaction (Supersignal; Pierce, Rockford, IL) . An affinity purified goat polyclonal anti-α-enolase IgG antibody raised against a peptide mapping near the carboxyl-terminus of human α-enolase, which is common to α, β, and γ isoforms of mouse, rat and human enolase (200 μg/ml; Santa Cruz Biotechnology, Santa Cruz, California, USA) was used as reference serum sample at a dilution of 1:100, according to the manufacturer's instructions. Anti-tRNP(Ser)Sec antibody reactivity was detected by ELISA or dot blot using recombinant tRNP(Ser)Sec antigen (Euroimmun). A high-titre anti-tRNP(Ser)Sec antibody positive serum was used as a positive control. To investigate whether the 50 kDa band immunofixed by anti-SLA is tRNP(Ser)Sec, inhibition experiments were performed using 3 anti-SLA positive serum samples, diluted at 1/1000, and pre-incubated with solid phase recombinant tRNP(Ser)Sec (Euroimmun, UK), as previously described . The affinity purified IgG antibody directed to human α-enolase gave a band of approximately 48 kDa in both human and rat liver homogenates as shown in Figure 1. A high titre anti-tRNP(Ser)Sec antibody serum gave a single band of ~50 kDa in both liver preparations (Figure 1). All but one anti-SLA antibody positive sera reacted with a ~50 kDa band similar to that obtained by the high titre anti-tRNP(Ser)Sec antibody serum in rat liver preparations (Figure 2) but none immunofixed a 48 kDa band. All anti-SLA antibody positive sera reacted strongly with the recombinant full length tRNP(Ser)Sec protein both in ELISA (mean titre 87 ± 23 RU/ml, cut off: 20 RU/ml) and dot blot. None of the anti-SLA negative sera reacted with tRNP(Ser)Sec. Anti-SLA positive, and anti-SLA negative sera reacted equally against recombinant α-enolase by immunoblot with 5/9 cases in each group giving a strong band (Figure 3). Immunoblot patterns produced by anti-α-enolases and anti-tRNP(Ser)Sec antibodies on electrophoretically separated primate and rat liver homogenates and dot blot results with recombinant tRNP(Ser)Sec. In both rat and primate liver preparations, a band of ~48 kDa is immunofixed by a polyclonal goat IgG anti-α-enolase specific antibody; a band of ~50 kDa is immunofixed by a serum containing a high-titre anti-tRNP(Ser)Sec antibody. 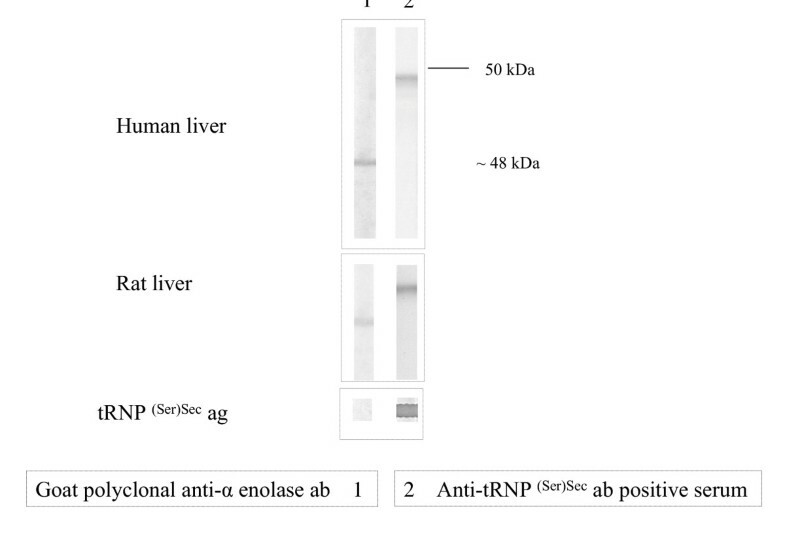 Anti-α-enolase antibody does not recognize tRNP(Ser)Sec by dot blot analysis. Immunoblot patterns produced on rat liver homogenate by (lane 1) a polyclonal goat IgG anti-α-enolase specific antibody; (lanes 2–5) four representative anti-soluble liver antigen (SLA) positive sera; (lane 6) a reference serum containing high-titre anti-tRNP(Ser)Sec antibody. Pre-incubation of anti-SLA positive sera with tRNP(Ser)Sec completely abolished the 50 kDa band immunofixed in either rat or human liver preparation. In contrast, a parallel experiment where the anti-α-enolase antiserum was pre-incubated with recombinant tRNP(Ser)Sec left unaltered the reactivity to the 48 kDa band. The findings of the present study indicate that α-enolase and tRNP(Ser)Sec are both expressed in primate and rat liver and have a respective MW of 48 and 50 kDa. They also show that anti-tRNP(Ser)Sec – but not anti-α-enolase – correlates with anti-SLA antibody reactivity suggesting that the target of anti-SLA antibody is tRNP(Ser)Sec and not α-enolase [1–9, 19]. However, Ballot et al  state that α-enolase is a major SLA antigen since rat α-enolases have MW of 47.4 to 47.5 and Pi values of 5.8 to 6.2. These characteristics do not match the MW (48.8) and Pi (8.6) of tRNP(Ser)Sec. 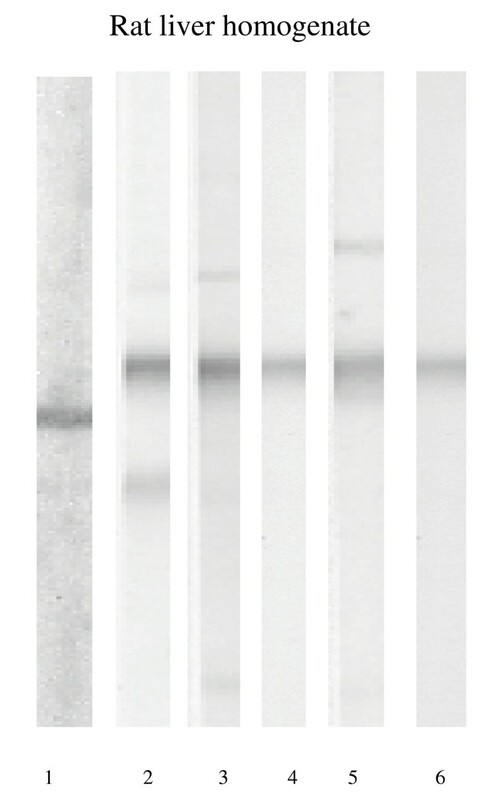 Ballot et al , however, show a Coomassie stained 2D-gel over the Pi range 6 to 11 and an immunoblot of this gel with several bands of a Pi above 8, but have not investigated these bands by MALDI-TOF analysis being therefore unable to rule out their possible relation to tRNP(Ser)Sec. All the above observations indicate that tRNP(Ser)Sec is the most likely target of anti-SLA. We thank Professor Huub J.M. Op den Camp (Department of Microbiology, University of Nijmegen, The Netherlands) for helpful comments. DP Bogdanos and G Mieli-Vergani are supported by the Children's Liver Disease Foundation (Birmingham, U.K.). G Mieli-Vergani is also supported by WellChild (London, U.K.). Y Ma is a Dorothy Hodgkin Fellow of the Royal Society (London, U.K.). DPB designed the study, performed the ELISA and inhibition experiments and contributed in writing the report. DG performed the immunoblot testing of anti-enolase antibodies. IB, SL & YM performed the immunoblot experiments involving liver preparations. RRM helped with the artwork. GMV provided clinical material and contributed in writing the report. DV supervised the study and wrote the report.